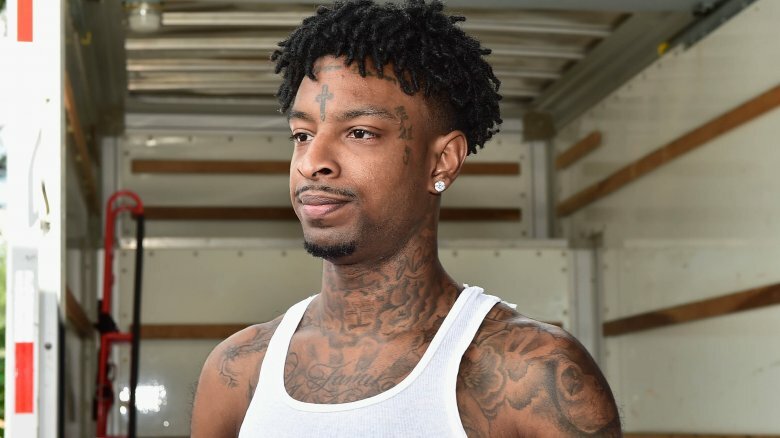 21 Savage (real name Shayaa Bin Abraham-Joseph) used to commit crimes to make a living, but in 2013, he decided to flex his skills as a rapper. He may have met him when he went viral for that now-now-infamous "issa knife" interview with Vlad TV. (The one where he explained that the tattoo on his forehead is not a cross.) Anyway, 21 Savage's signature sound — slurred words in combination with beats backed by Atlanta's record producer du jour, Metro Boomin – solidified his position as one of rap's best newcomers of 2016. He has since teamed up with Drake on "Sneakin'" and with Post Malone on "Rockstar." The latter earned two Grammy nominations in 2019. Little by little, the I Am > I Was artist has opened up about his troubled upbringing, from joining a gang to experiencing murder and violence at an early age. His life isn't all grim and somber, though. Behind the struggles is a man who is described as a philanthropist, the coolest dad ever, and a citizen of the United Kingdom. Wait, what? If you had no idea that 21 Savage isn't really from Atlanta — the city he shouts out in numerous songs, including the Zaytoven track "East Atlanta Day" — you're not alone. In fact, there's a lot about the "Bank Account" emcee that may surprise you. This is the untold truth of 21 Savage. 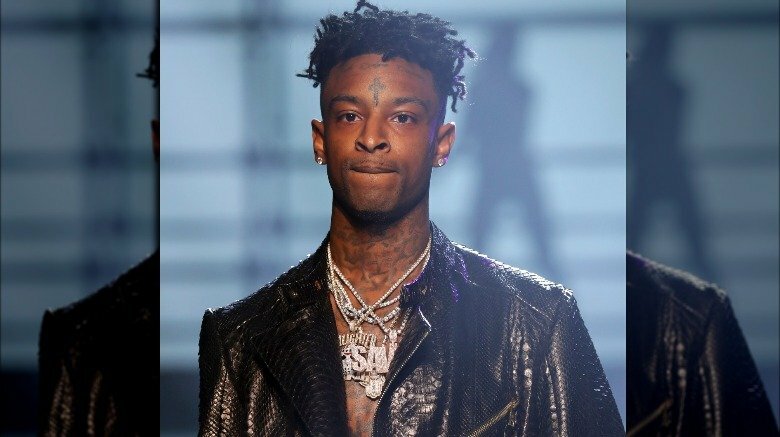 There has been a lot of speculation about the origin of the name 21 Savage, and the rapper said it's much "deeper" than just a number in an interview with Rap Radar. According to the "X" artist, "21" pays homage to the 2100 Street Gang from his neighborhood in Atlanta. He said his life growing up was like the real-life version of the 1988 film Colors, which chronicles the battle between the Los Angeles street gangs the "Crips" and the "Bloods." Being affiliated with the 2100 Street Gang meant this young man was also in the midst of a constant street war. He saw a lot of his friends get killed, while others went away to serve life sentences behind bars. As for the "Savage," well, it's from "being a savage" on the streets, he told DJ Smallz Eyes. So now you know. Being from the "hood-hood" and being — as he described —"ratchet," made his school years less than stellar. 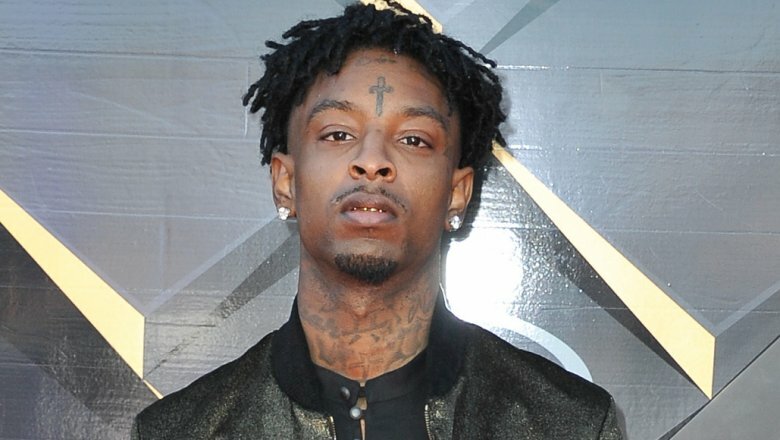 During an interview with The Breakfast Club, 21 Savage claimed he raised hell as a student and was constantly getting in fights in the back of the school bus. Even his mom had a hard time controlling him. While he wasn't winning any student of the year awards for his behavior, he was far from being unintelligent. "I'm doing my work, I'm getting A's and B's, though. I'm not dumb from a long shot," he said. "I'm smart. I do my work. I'm just bad." He told XXL magazine that he got expelled from Georgia's DeKalb County public school system when he was in seventh grade for bringing a pistol on campus. He wound up doing time in juvenile hall, which "was really fun," he told GQ magazine. In ninth grade, he dropped out of school. Now that he's a father, the rapper sees life a lot differently. The days of living like he has nothing to lose are long gone. Instead, 21 Savage wants to build enough wealth for the ones he loves the most. "I wanna leave behind a plane and a big-a*s house," he told XXL. "And I wanna have a company, an establishment that's making a lot of money. That's what I wanna leave my kids with." Growing up on the gritty streets of Atlanta, 21 Savage went to extreme and violent lengths to make a living. "I used to rob the hell out of everybody," he told GQ magazine. "If you had it, if it was worth something, I'd take it." He claims the fastest car he ever swiped was a Camaro SS. Despite all of his alleged activities, at the time of that interview, he was lucky enough to have only one felony charge on his rap sheet. That incident took place when he was reportedly arrested while riding in a car filled with contraband. "It wasn't my fault, though, and I done sold every drug, robbed every — I did everything there is to do, except rob a bank," he said. "I swear to God on my life I did everything in between. 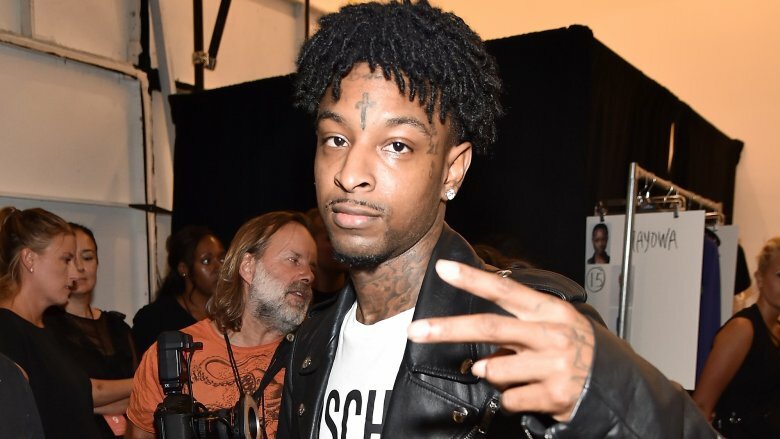 And I ain't never go to jail for that s**t."
21 Savage's journey to becoming a formidable artist in the hip-hop industry began under less than glamorous circumstances. He grew up immersed in the street culture that overran his neighborhood, and on his 21st birthday, he was riding in a car with his best friend, Johnny. According to The Fader, the pals were involved in a "deal that turned into an attempted robbery." Johnny was "shot in the head" and killed, and 21 Savage was shot six times. Wounded, he allegedly attempted to shoot the two assailants, and afterward, he "shut Johnny's eyes, got out of the car, closed the door, lit a cigarette, and waited nearly 30 minutes for the ambulance to come," The Fader reports. While chatting with Seth Rogen for an Interview magazine feature, the "Whole Lot" rapper said that while recovering from his injuries, he spent a lot of time in the studio. "My best friend who died, his uncle had a whole lot of dope money, so he started buying me studio sets and s**t," 21 Savage said. And, thus, the Saint Laurent Don was born. 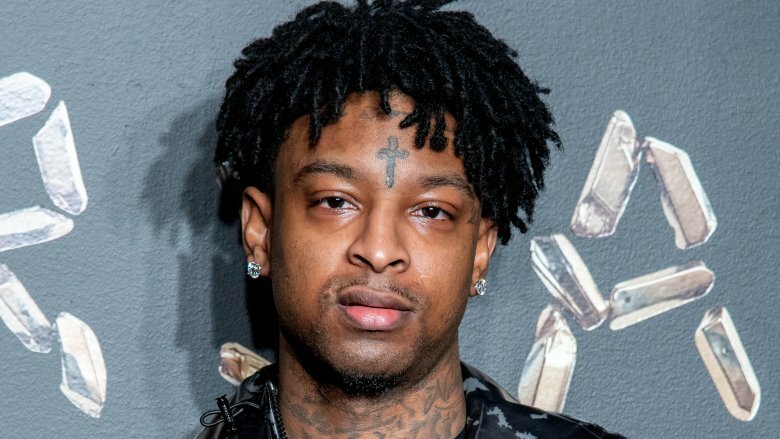 Back in 2016, 21 Savage was living in a one-bedroom, "barely furnished" condo. Despite the cramped quarters, the doting dad still made time to have his three little ones — a daughter and two boys — stay with him. He told The Fader that they all shared the same bed. 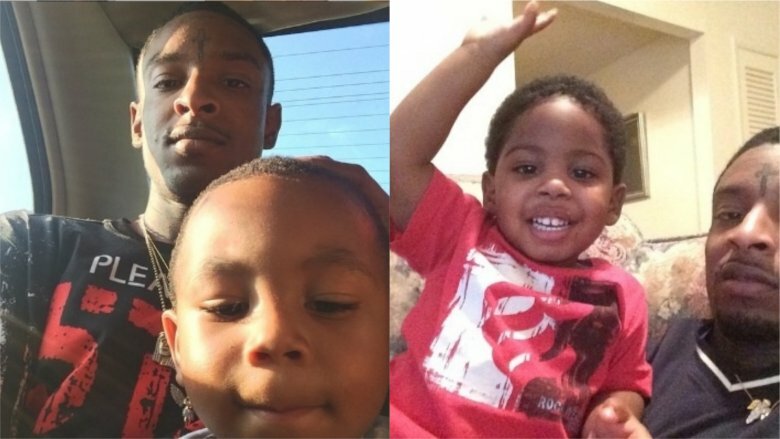 The rapper occasionally shares photos of his kids on his Instagram account, but don't let their adorable faces fool you. "They really [are] all, like, mean — not mean but they just not friendly," 21 Savage jokingly told The Fader. Hmm… perhaps they take after their dad's tough-guy persona? His children mean everything to him, and he told XXL magazine his favorite pastime is picking them up and helping them dunk a basketball into a hoop. As for his parenting style, he prefers a more relaxed approach, allowing them snack on candy, play videos games until the wee hours of the morning, and watch cartoons all night until they drift off to sleep … in his bed, of course. In other words, he allows them to "do what the hell they want to do." And he doesn't want to be their role model. He told XXL magazine: "I try to be more like a superhero than a role model 'cause I don't want them to go through what I went through like, growing up and stuff." He sports a menacing dagger tattoo between his eyes in honor of his brother, Quantivayus "Tayman," who had the same ink tatted on his face. Tayman was killed in a drug deal gone wrong, according to The Fader. The juxtaposition of his multiple face tattoos and the real 21 Savage is quite ironic. He may look threatening — and maybe he was a dangerous criminal at one point — but he has reportedly turned over a new leaf. He frequently gives back to those in need because being charitable is something that comes "from the heart," he told Interview magazine. "I don't do it for recognition, you know what I'm saying? That's just me as a person." His charitable endeavors range from holding up an "I'm a h*e too" sign at ex-girlfriend Amber Rose's "Sl*t Walk" to partnering with Get Schooled to launch the 21 Savage Bank Account Campaign for kids. He even presented a $21,000 check to the latter on an episode of The Ellen DeGeneres Show. It's a bird, it's a plane, it's Pilot Savage! 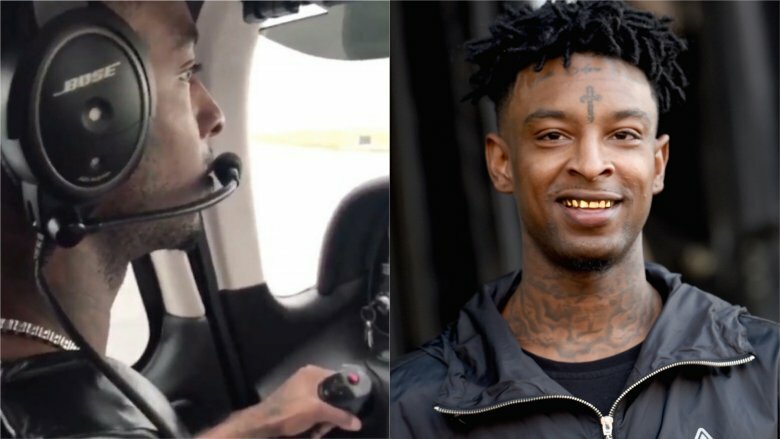 If he had it his way, 21 Savage would have enlisted in the Air Force so he could fly the friendly skies for a living. Sadly, because of "behavioral problems," his military dream "didn't work out," he told Interview magazine. However, dominating the Billboard charts gave the rapper a chance to pursue his goal in a different way. He's reportedly training to fly airplanes and plans to buy his own jet. What's his dream destination to fly to? "I'll go to Mars, even if I got there and died on the way back," he told XXL. "It's just the opportunity. How many people can say they went to Mars?" The man has a point. It might be awhile before he gains the skills for interplanetary travel, but he's taking things one step at a time. The rapper even posted a video on Twitter of him safely landing a plane. What do most rappers do once the money starts rolling in? Buy a ton of iced-out jewelry, of course. 21 Savage is no different. He famously splurged on a diamond-encrusted replica of his own face that was priced at $125,000, according to the website Niv's Bling. However, that was back in 2017, and the rapper has since changed his tune when it comes to bling. "I stopped wearing jewelry for a couple of reasons," he told Vogue magazine. "One is because everybody wears jewelry. I outgrew it; I'm getting a little wiser and growing so." His second reason? He says the affluent people he encounters are always sans jewelry. "Every time I meet someone who's very, very rich, like wealthy, I've never seen them with jewelry on," he said. "And ever since I've been saving money and not spending it on jewelry, I've been getting way richer." 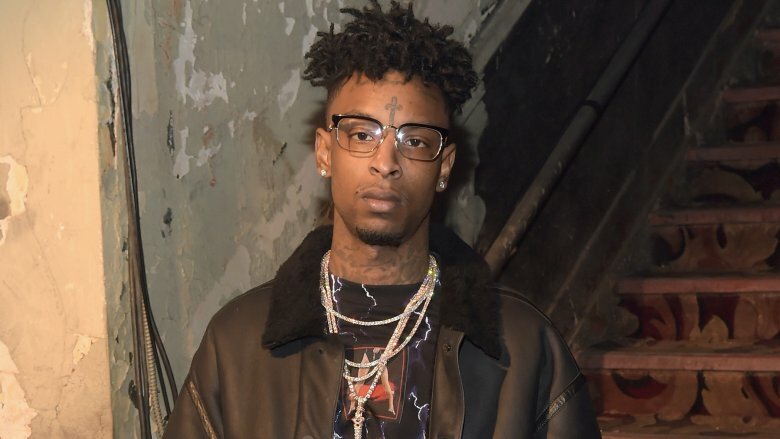 The rapper's manager confirmed the artist's vow to halt his jewelry purchases by announcing on Twitter that 21 Savage would instead be using his cash to invest in businesses and "crypto & youth start-ups." 21 Savage became a hip-hop favorite after penning lyrics about his life of crime and his love for flashy designer duds, but while crafting 2017's Issa Album, he decided to throw some new topics into the mix. "Now I be trying to talk about other things that other people can relate to," he told Rolling Stone. That meant reciting lyrics about Civil Rights leaders Martin Luther King Jr. and Rosa Parks and rapping about systemic racism. That said, he told XXL magazine in April 2018 that he doesn't pay too much attention to the political climate in the United States — in particular, Donald Trump's intent to build a wall at the Southern border to stop illegal immigrants from entering the United States. 21 Savage told Vlad TV in a 2016 interview that he grew up in various parts of East Atlanta. That was the same story he sold to many of his fans, but the whole truth came out when he was arrested in Atlanta on Feb. 3, 2019 by U.S. Immigration and Customs Enforcement (ICE). 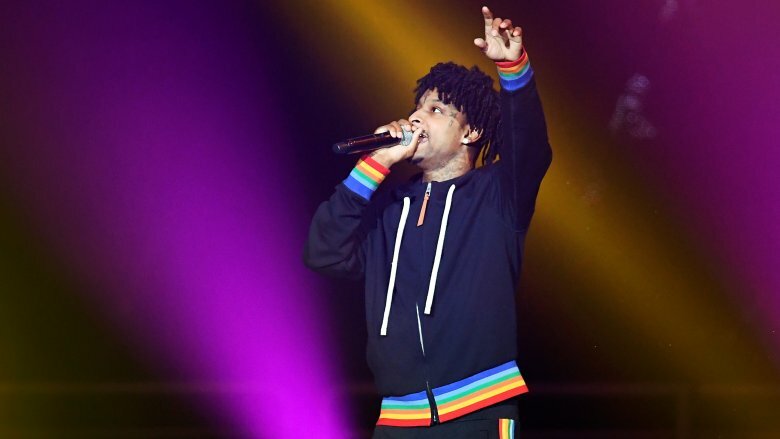 The agency claims the rapper is a U.K. citizen who entered the United States legally at the age of 14, and "under the terms of his non-immigrant visa, 21 Savage was required to leave the U.S. by July 2006," reported Fox 4 News. The rapper reportedly overstayed his visa. 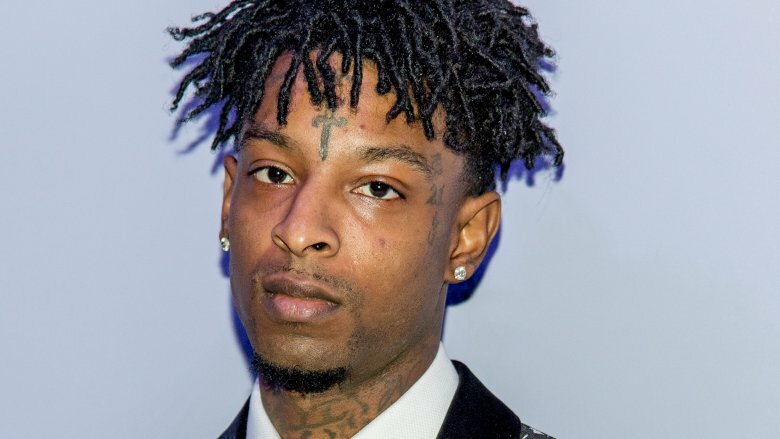 His immigration lawyer, Charles H. Kuck, released a statement (via Rolling Stone), saying that 21 Savage entered the country when he was 7 and "lost his legal status" in 2006 "through no fault of his own." The statement added that the rapper applied for a "U Visa" in 2017, four years after he was severely wounded in the aforementioned shootout that took his best friend's life. The U Visa aims to protect "victims of crime and their families." The rapper's legal team believes he was targeted by ICE because of lyrics in music released "five days prior to his arrest" that condemned "the behavior of immigration officials for their detention of children at the border." 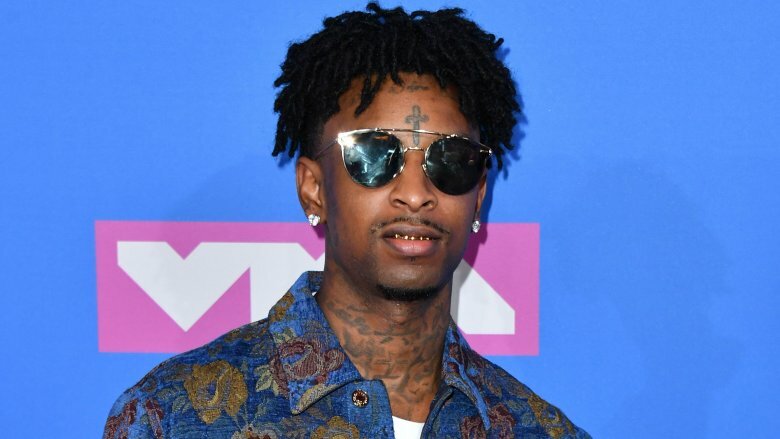 As of this writing, 21 Savage remains detained at the Irwin County Detention Center in Ocilla, Ga., according to The Blast. 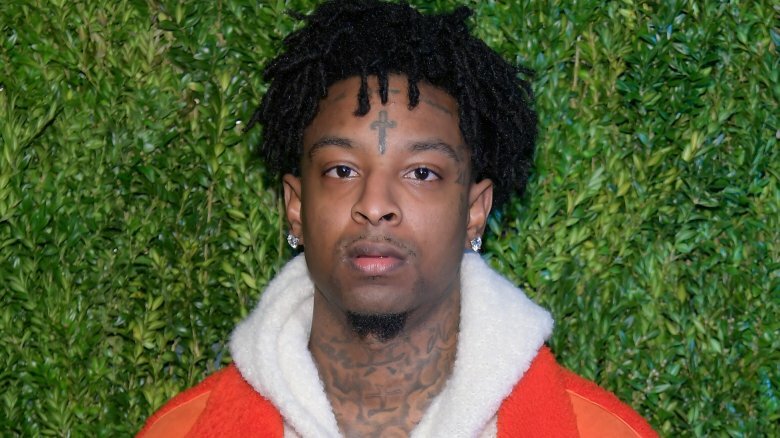 21 Savage was released from an immigration detention center on Feb. 13, 2019 after being held for 10 days. His mom, Heather Joseph, shared a celebratory photo with her son standing in front of a private jet set to whisk them away. In an Instagram post, Joseph thanked the artist's legal team, which included New York-based immigration lawyer Alex Spiro, who Jay-Z's Roc Nation entertainment company hired on the rapper's behalf, according to TMZ. But 21 Savage's troubles are far from over. Two days after he was released from custody, the rapper turned himself in to authorities on a separate charge of "theft by deception." That charge stems from a 2016 incident where 21 Savage was hired to perform at a Georgia club. He was allegedly given a "$9,500 advance from the promoter and got the $7,500 balance when he showed up at the club," TMZ reports. However, he allegedly pocketed the money and left without taking the stage. Though 21 Savage has "A Lot" of problems, including the fear of being deported, he told Good Morning America that he has "learned to embrace the times when I'm down, because they always build me up and take me to a new level in life."